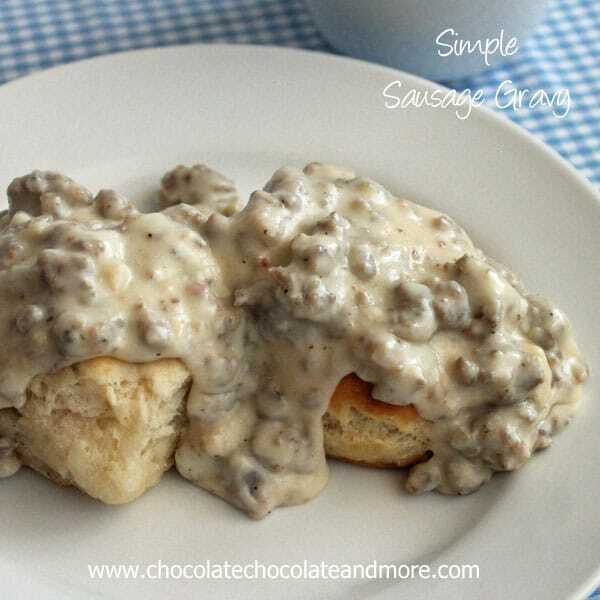 Simple Sausage Gravy - Chocolate Chocolate and More! 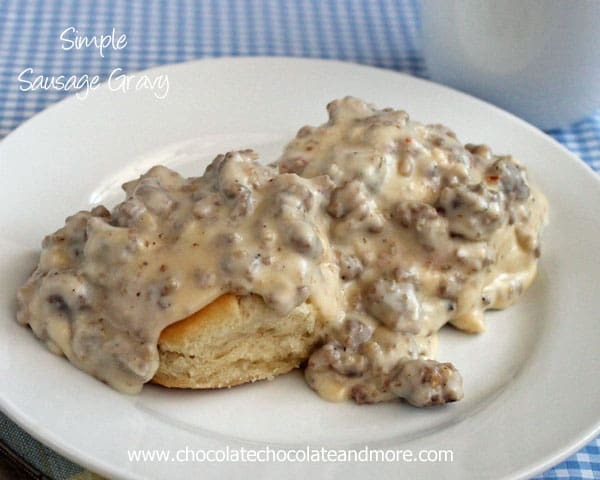 Simple Sausage Gravy and Biscuits-a Southern Favorite! I know, I know, this isn’t chocolate. It’s not even a sweet. 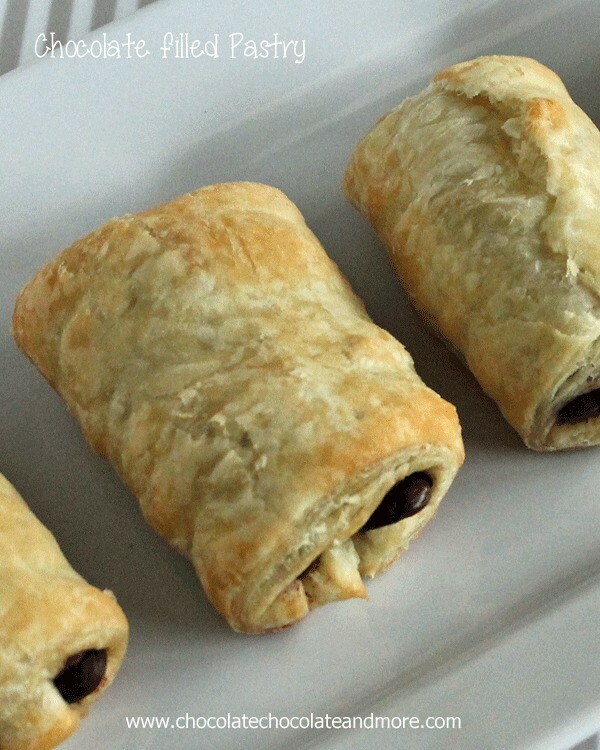 But sometimes I have to share a family favorite recipe. My kids just can’t get enough of Sausage Gravy. We have it for breakfast and even sometimes when I’m rushed, I’ll serve it for dinner. We serve it over biscuits- homemade, canned or frozen. They love it over toast. We even have it over leftover rolls. The key to good sausage gravy is starting out with good sausage. You want a spicy sausage. I use Jimmy Dean but any brand will work. In the time it takes for your biscuits to bake, you can have this gravy ready. Preheat a large frying pan over medium heat. Add sausage, using wooden spoon break sausage up into crumbles. While cooking, season meat with salt and pepper. Once meat is completely cooked, Sprinkle flour evenly over meat, then stir to coat. Slowly add 2 cups milk to sausage while stirring. Let come to a low boil, stirring occasionally, will take less than 5 minutes. Add more milk if gravy is too thick. Serve over biscuits split in half. 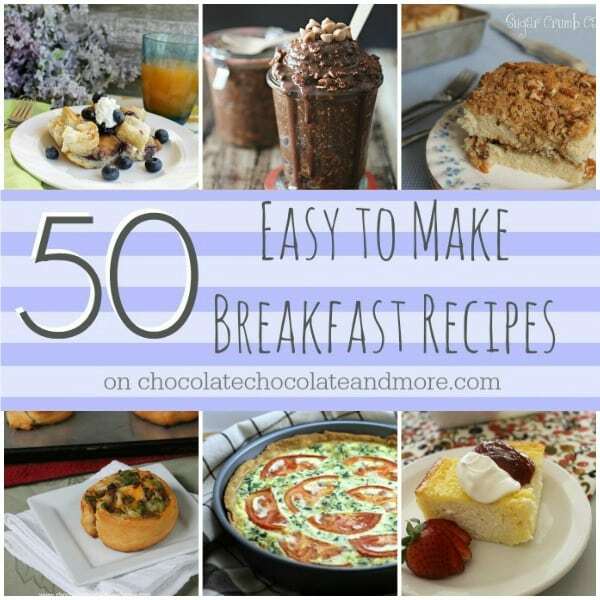 Want more ideas for breakfast? 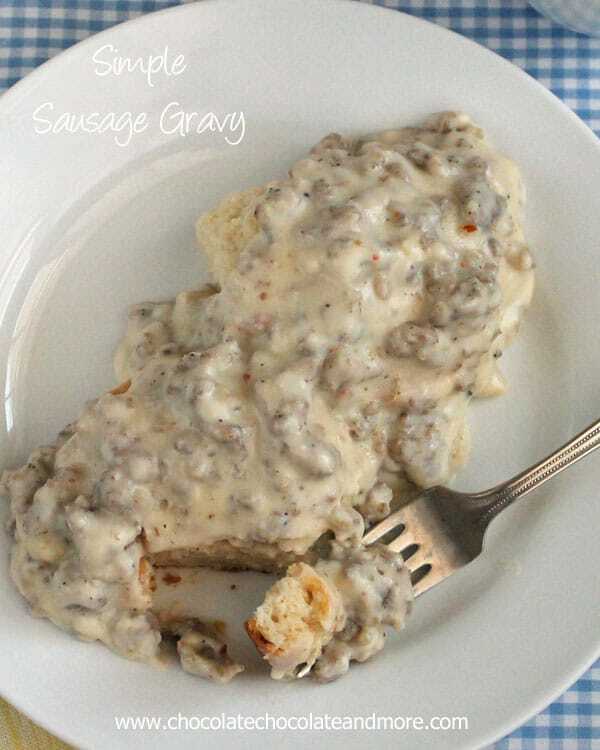 I often make sausage gravy at home, and love to order it for Breakfast when dining out! 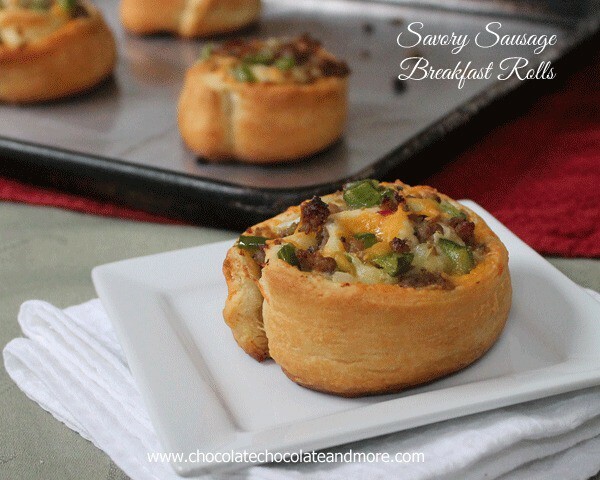 This has always been a favorite of mine for breakfast. It makes a tasty dinner, too. Sausage and biscuits is one of Brian’s favorite “brinners” (breakfast for dinner)! This looks amazing! I’m rubbing my eyes and pinching myself because I can’t believe how good that looks. Do you know that I have never eaten biscuits and gravy? These look really good though so I am adding it to my foodie bucket list. Hope your family is doing well Joan! Oh, my goodness, yes. I could eat this for breakfast, lunch, or dinner. Yum! Thank you for stopping in and linking with See Ya in the Gumbo. OH I meant to also say that I definitely plan on having my bf make this next time! Thank you so much! 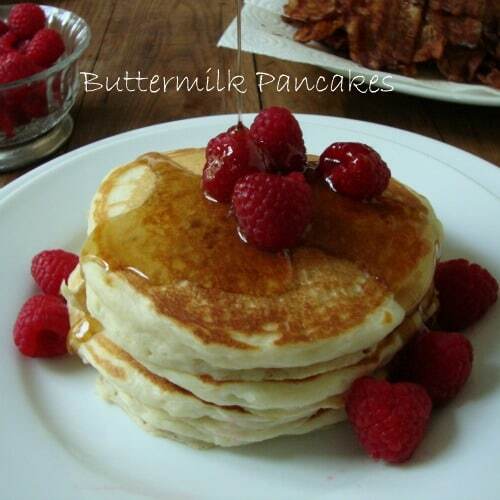 it makes the morning breakfast perfect! So simple!! I used your recipe for my first time sausage gravy experience! I love it! I’ll be sharing at my Southern Cuisine potluck at my office tomorrow! I’ll let you know how it goes. Thank you for sharing! I hope everyone enjoys it as much as we do around here! 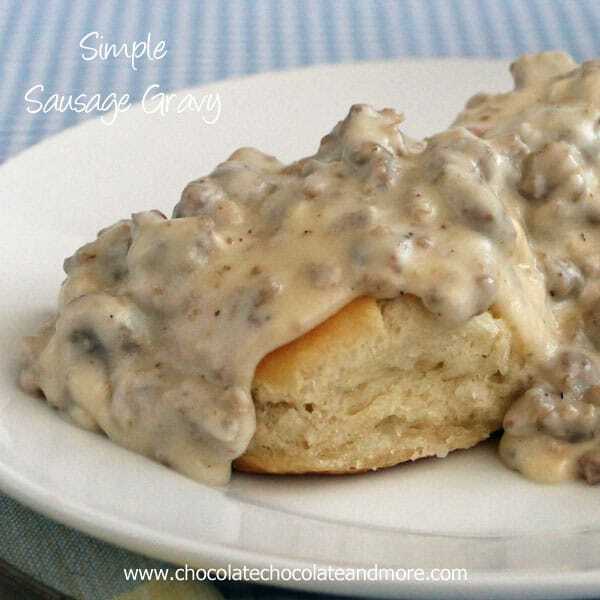 I’ve always wanted to make homemade sausage gravy and bisquits…but it always “seemed” to difficult. After coming across your recipe, I decided that seemed simple enough to give it a try. 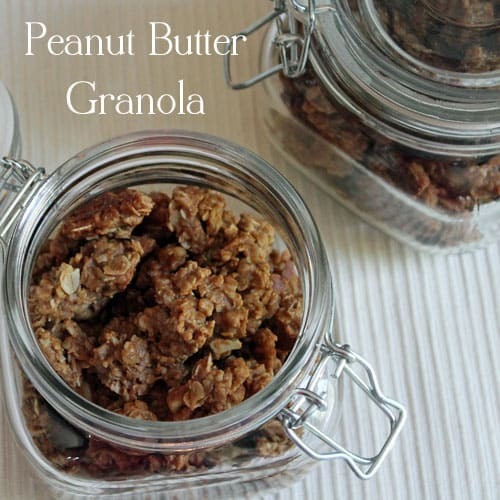 I’m SO glad I did….not only was it simple…but it was super yummy! I used your gravy recipe when hosting my first “american” brunch in Milan, Italy 🙂 It was super easy and looks amazing! Hope my guests enjoy it, thanks for sharing it!! Easiest gravy I’ve ever made!! Turned out amazing!! I used 3tbsp flour and 2cups of milk and it’s the perfect consistency! 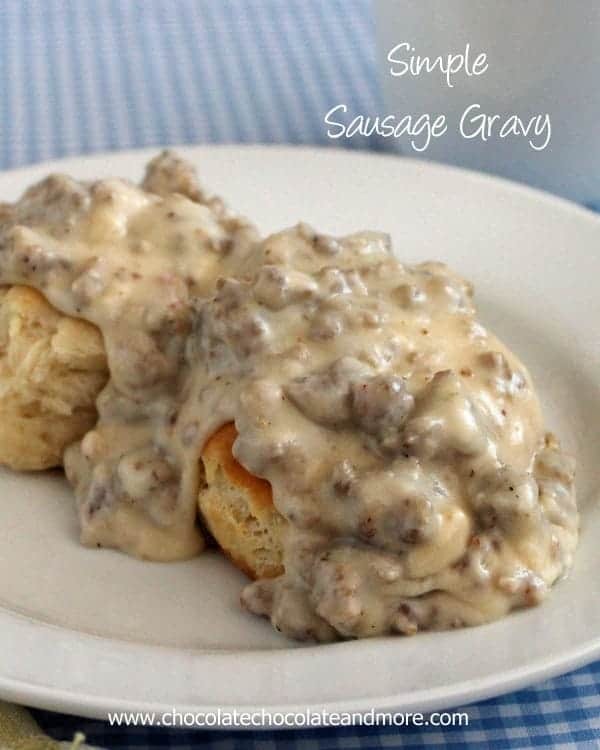 My boyfriend said these were the best biscuits and sausage gravy he has ever had! Wow, what a nice compliment Nicholette, thanks for sharing!